The Boeing 720 was a shorter and lighter derivative of the 707. It was Boeing's first attempt at a medium range, medium capacity jetliner. Even as the 707 was entering into service, Boeing saw the opportunity for a smaller version to enter the medium range market. At first known as the 707-020, the 720 made its debut with United Airlines, who swore that they wouldn't have a “smaller” number than their rivals American and Pan Am and thus the 720 received its name. Less commercially successful than the 707, the 720 nevertheless was instrumental in satisfying the public's demands for jet travel along the airlines' short and medium distance routes. The jet powered 720 was followed by the turbofan 720B (and many 720s were converted to the more economical turbofan engine). The 720 served for many years in second-tier airlines and cargo operations, with the last airframe being retired in the early 21st Century. This is the second issue of Roden's 720, the first being a VIP version used by several '70s rock groups, most notably Led Zeppelin. This box is the more workaday airline version. Details are very crisp and the execution is clean. The plastic is Roden's familiar brownish and slightly pebbly product. Panel lines are fine engravings. Even though Roden's kits are looking more and more like mainstream kits with every new release, it is important to remember that they are still a “limited-run” manufacturer so some challenging building is to be expected. The fuselage is moulded in two halves and a Heller-style cockpit cab cover in clear. The windows are moulded open with clear windows in strips to be inserted from the inside (one of the review sample's strips is broken, but the repair will be easy, and not visible from the outside). If you intend to leave the windows clear the interior should be painted black. The instructions only show the windows inserted into the left fuselage half. This may confuse less experienced builders although there is a small symbol which means "repeat for port/starboard". Some reviewers have faulted Roden for placing several fuselage panel lines in the wrong place when compared to Boeing drawings. More fundamentally the windows are slightly small, their spacing is incorrect and the overwing escape is one window too far aft. Purists will wish to fill these and engrave them in their correct locations. The cockpit window frames have received some criticism for being too thick. These window troubles will not be a problem if you choose to use decal windows. If you wish to leave them clear you'll need to do a fair bit of work to correct them. There is no cockpit bulkhead to confine the nose weight. The nose gear well and portions of the main gear wells must be placed before closing the fuselage. The tips of the fin on both fuselage halves of the review sample were damaged in transit. This may or may not be chronic to the kit given that the box is only slightly longer than the fuselage. Since the plastic is very thin, making repairs will be a little tricky without melting the trailing edge. Superglue or epoxy putty should be considered rather than solvent-based methods. There is an optional fin tip with the characteristic Boeing HF antenna if your subject requires it (this would render the question of damage moot given the cutting involved). None of United's 720s were equipped with HF radios so if you wish to do the box top aircraft you'll leave this off. The “double bubble” lobe crease is missing. It will take a fair bit of scribing and sanding to create it. No mention of nose weight is made in the instructions. My experience with other 707 variants suggests that weight will be needed. The wings are offered in top and bottom pieces for each wing. The main gear wells have some minimal detail. More is left to the option of the modeller, but unless the model is turned upside down it won't be seen. Only one wing is illustrated in the instructions, and once again the "repeat for port/starboard" symbol is used. The tailplanes are one piece each. They fit well enough after being cleaned up that they may be left off until after painting if your desired paint scheme includes a full-length cheatline. The mounting pins are quite small, so replacing them with plastic rod or wire may be desired. The engines are offered in halves, with a separate seamless intake and the characteristic “organ pipe” sound suppressor. Pay particular attention to the pylon configuration. There are 2 engines with a turbocompressor at the front of the pylon and 2 without. The 2 without are the outboard engines. Fan engines can be robbed from a Minicraft 707 or purchased from Contrails if you wish to convert the kit to a 720B. Be careful there as well, because unlike the 707, the 720 never had 3 turbocompressors, so one of them will have to be removed. The pylons should be drilled and pinned into the wings for strength. This is where Roden made their greatest error because the engines are quite a bit too large both in length and diameter. This will not be glaringly apparent unless you have your model parked next to one with correctly sized engines. Modellers concerned with accuracy can replace the engines with aftermarket parts which ought to be available from Authentic Airliners in the near future. Edited to add: Welsh Models has confirmed on Dec 14th 2013 that they will offer replacement engine sets. Each set will cost £8-99 per set P&p of £5-50 - overseas rate. To order, contact Welsh Models through their website. Supplies are limited so do not delay. The landing gear struts and wheels are very finely moulded. They will benefit from a little extra detail, but they'll also look good without it. The gear doors are thinner than most injection kits, and have a decent amount of detail moulded into the inside faces, something most airliner kits ignore. The 720's main wheels were actually smaller than their nose wheels due to the aircraft's lighter weight compared to the 707. The kit's main wheels are not accurate in this respect. If you wish to correct them, they may be sanded down to the correct diameter. The main strut doors must be bent to shape before being glued in place. The instructions only show one gear strut, which may confuse less experienced modellers. I don't compare models to drawings or published measurements. When assembled it will look like a 720 with fat engines. The kit comes with one decal option for N7205U in United Airlines' 1960s scheme. These are Roden's newer decals which behave much better than their old decals. No window decals are provided so modellers wishing to use them must resort to aftermarket. The marking scheme instruction sheet is printed in full colour, which is a refreshing change from trying to guess which pattern of small grey dots is supposed to represent which colour. The colour names are all generic, and the wing painting instructions are simplified, ignoring the actual colours in which the aircraft were painted in favour of overall “silver”. If you wish to do another scheme the aftermarket provides several options. 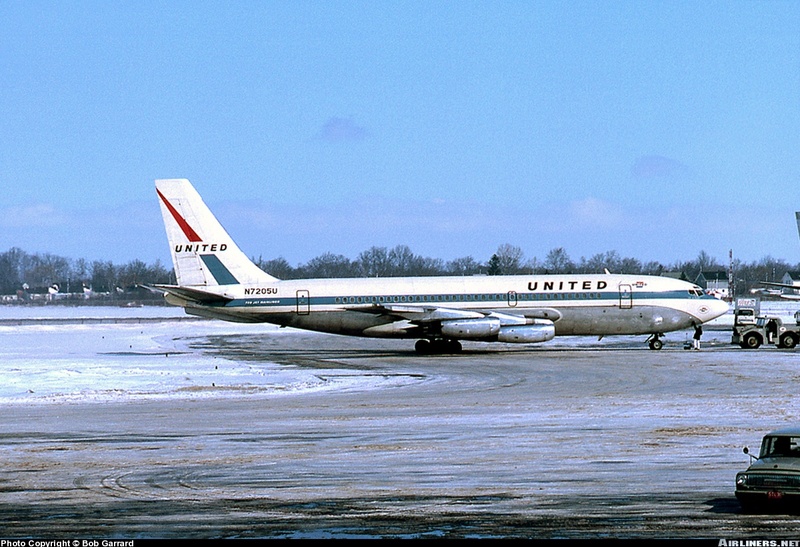 N7205Uin the kit's paint scheme during the late winter of 1967. Highs: Fine detail, fair shapes and simple parts breakdown. Nice selection of aftermarket markings available. Lows: Several inaccuracies, the worst of which being the overly large engines. Verdict: Beginners won't care about the inaccuracies, and the worst ones are simple enough for most modellers to cure. Very decent review. Comprehensive and informative. Now that my aftermarket engines have arrived, I can do a direct comparison. Welsh Models above, Roden below I'll leave it to each modeller to decide which engine suits them best.